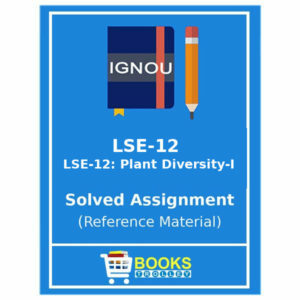 The students of Indira Gandhi National Open University may require IGNOU LSE 1 solved assignment as reference material to prepare their Tutor Marked Assignment (TMA) of Ignou B.Sc. Life Science course.This reference IGNOU BSC assignment for LSE-01: Cell Biology course will help students in completing their task. This assignment is valid for July 2017 and January 2018 session. The last date of submission of LSE-01 assignment is March 31, 2018 for July 2017 Session and September 30, 2018 for January 2018 Session. IGNOU LSE 1 assignment is valid only for students who are pursuing B.Sc. Life Science programme. It comes under the category of IGNOU BDP solved assignments.